Today we live in a dizzying world with so many countries, cultures, religions, denominations etc. However the fact that the entire world and the spiritual world is divided and belong to either one of two domains, remains the fundamental truth. Everything you see, touch, feel, smell and the things that you cannot see nor feel (but exists) belong to either one of these TWO domains. Generally when you try to understand something in the unknown territory, the task often looks vague and cloudy with more questions than answers. However the same becomes clearer once you have accomplished it with understanding. Same principle can be applied to spiritual understanding. Spiritual TRUTH is a vague and cloudy subject for most, primarily due to lack of first hand understanding and knowledge. The worst part is, myths that dominate for centuries becomes so legitimate that no one takes special efforts to evaluate. It is understandable that this is a subject that cannot be easily evaluated and thus myths become traditions and the way of life. Here is an unique opportunity to learn the TRUTH from someone who had firsthand opportunity to understand the TRUTH, and through this truth he took victory over disaster and death. You can learn this LIFE GIVING TRUTH without going through such misery. First, you should understand that TRUTH CANNOT BE VAGUE nor cloudy. If it is, then it is not the truth but the opposite. If you are someone who would say 'I Know Everything' then evaluate your knowledge based on clarity and precision on the subject. Remember... myths and stories can never become the truth regardless of your faith and the number of generations it existed. There is no greatness to quote your faiths age and its genealogy. Simply because one generations beliefs are forwarded to the next and this can go on any number of times. This could be a hard to swallow pill for many, however the founder of this ministry had no choice but to swallow and accept the TRUTH, when his faith and its roots were shattered to utter foolishness. Read his life's testimony to understand its details. To begin with, the first and foremost spiritual understanding one must never forget is that, the entire world and the spiritual world is divided into two. 'JUST TWO' Either it belongs here or there. The First is the God's Domain, the 'Domain of the Creator'. The Second Domain is that of the Satan's, the 'Domain of the Destroyer'. Satan in his original form, was an Angel serving the Holy God - the Lord of Armies. He was also known as Angel of Light with the name Lucifer. He was one of the most beautiful, higher ranking and powerful Angel amidst others in Heaven. 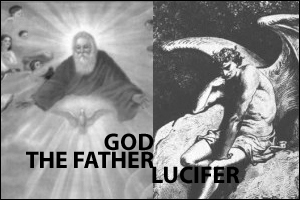 Lucifer later began to dream of capturing the throne of Heaven and becoming the God. He deceived and formed his own group to wage war against the Holy one. It is a fact that those who are evil are also foolish, thus the war concluded the end of Lucifer's glory and was casted down to Earth along with the rest who followed him. 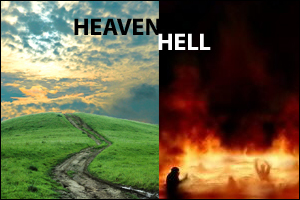 Therefore, God's enemy is Satan and Satan's foremost goal is to separate God and his children (humans) through systematically deceiving them to commit every kind of SIN imaginable (including worshiping gods other than the True Living God). Surprisingly enough, the world we live in is ruled by the Evil one. We are in fact living in his kingdom in the grace of God! We humans do not belong to Earth, our stay in this place is temporary. While we live this short life, our focus should be to overcome Satan's traps and reach out to God and serve him instead of serving Satan and his devices. As mentioned earlier, everything is divided into TWO including your acts, beliefs and practices. You either do what is right and serve the True God or lead a deceived life and serve the Evil one. In this ministry, we focus to 'Rescue God's Children' from the Evil One. This may sound easy, however it is not that easy because the world is so bound to its ways and deception that no one wants the truth or has the time for God. Nevertheless, we hold this massive undertaking because Jesus Christ, the Son of God gives us the authority over Satan 'The Evil Master of this World and its Sins'. It is like living in a kingdom where the king is in our authority. Our authority comes from Jesus Christ, the Son of God and our protection comes from 'Blood of Jesus' and Our weapon is 'Prayer'. Thus Victory Belongs to Us, forever, while Satan, the King of this World is under our foot. Why So Much Power for His Blood? We will eventually develop a detailed section to educate all about the Blood of Jesus. Because if you do not understand this, then you cannot claim victory over the evil one the way we have achieved. Sin brings Death. While blood is life, the only form of payment for SIN is through blood. Without spilling blood there could be no payment for SIN. Can You Pay this Price Through Your Blood? It is unthinkable to pay SIN through sinful blood. Therefore God sent his own son into this world through a virgin in order for him to pay for our SINS. Through his Blood he paid the price for our SINS and SIN can no longer separate MAN from GOD. On the day Jesus Christ resurrected from death, he also won over eternal death of man kind. Thus his blood gives us eternal life and inheritance to the kingdom of God. Basically, Love of God for us, His children is so Great that he did not even withhold his only Son, but became the Lamb of God for our SINS. Therefore, understand the TRUTH: Jesus Christ paid the price for our freedom. All you have to do is claim your freedom by accepting Him as your Savior and God and attain victory over the powers of the Evil one. Contact us if you need personal prayer and assistance in accepting Jesus as your Savior and God. Visit "Your Salvation" page for more details about acceptance and salvation. Remember... No Man Can Inherit the Kingdom of God (Heaven) Without Jesus Christ.